Pamphlets carrying a DA letterhead and urging whites to try “by all means” to convince their “domestic worker” to vote for the DA, have been circulated in Du Noon. 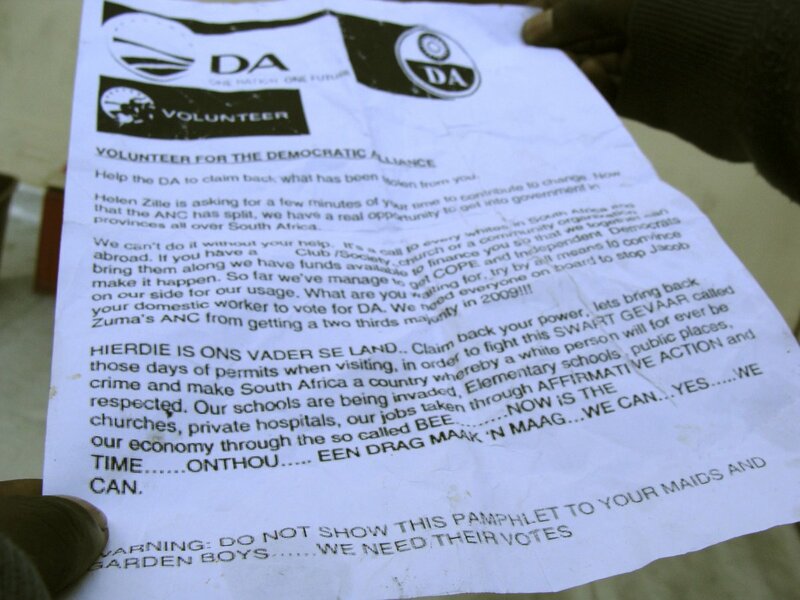 The photocopied black and white pamphlet carries phrases such as “HIERDIE IS ONS VADER SE LAND (sic)” and “SWART GEVAAR (sic)” and urges voters to “make South Africa a country whereby a white person will for ever be respected”. It ends with a warning to readers not to show the pamphlet to “your maids and garden boys…we need their votes”. Du Noon residents said the pamphlets had first been handed out on the weekend. While they may be new in the Western Cape, the same or similar pamphlets first surfaced in Mpumalanga about six weeks ago, whereupon Mpumalanga DA leader Anthony Benadie laid charges against the ANC with the Middleburg police. Speaking yesterday (21/04/2009), Benadie said three weeks ago he had been told by the police that their investigation was complete and the matter had been referred to the senior public prosecutor for a decision on whether or not to prosecute. Benadie said he had heard nothing since and their office had been too busy campaigning to press the matter. “We will pursue the matter after elections,” he said. He said the DA had “concrete evidence” that the ANC were responsible for distributing the pamphlets, and the pamphlets had surfaced again this week in Witbank, Secunda and Nelspruit. He said the matter had also been reported to the Independent Electoral Commission (IEC), but they had “done nothing” despite the fact that it was a criminal offence to distribute fraudulent information. Yesterday (subs: Tues) DA leader Helen Zille, when asked about the pamphlets, said it was the first she’d heard about them. Zille said what the pamphlet contained was in line with the ANC’s “lies” about the DA. She said the ANC had been “spreading lies” about the DA to such an extent that “black people stopped me in the street today and asked me if I’m sending them back to the Eastern Cape”. But she said she hoped voters would be intelligent enough to realise the pamphlets were fraudulent. Provincial IEC spokesperson Courtney Sampson said he had not seen the pamphlets. “This is the first time I’ve heard about it,” said Sampson. He said if it was fraudulent he would “have no hesitation” in making a condemnatory statement. “Every pamphlet, poster and billboard must have the name of the publisher on it. It is part of the Electoral Act,” he said. The pamphlet in question has no such information. Mpumulanga electoral officer Steve Ngwenya said he was aware of the pamphlets being distributed in his province and the matter had been discussed with the DA, who were urged to lay a criminal charge with the police as it was a criminal matter. Ngwenya said the matter was still before the Middleburg Magistrate’s court, with the accused’s next appearance set for May 12. He did not know the name or political affiliation of the accused. ANC provincial chairperson Mcebisi Skwatsha said the ANC was “concentrating on getting votes for the ANC”.